Uncategorized Category Archives — Massachusetts Injury Lawyer Blog Published by Boston, Massachusetts Injury Attorneys — Breakstone, White & Gluck, P.C. Massachusetts State Police are investigating a tragic crash which killed a female cyclist today in a heavily congested Boston intersection. The bicycle crash happened in the city’s Fenway neighborhood, less than a half mile from Fenway Park. Witnesses described a frightening scene as emergency responders attempted to resuscitate the woman, according to WBZ-TV. The woman was transported to Brigham & Women’s Hospital, where she sadly died from her injuries. The woman’s bike was left crushed in the road as State Police blocked off two traffic lanes to investigate. The cement truck reportedly struck the woman on Brookline Avenue at Park Drive around 1:30 p.m., according to Boston.com. Just before 4 p.m., State Police reported the woman had died. The cement truck read, “Boston Sand & Gravel Co.” The driver reportedly stayed on the scene and was also transported to a hospital for evaluation. At this time, State Police have not released the name of the woman, the driver or confirmed the cement truck’s owner. News photos showed the truck crash that killed the cyclist was near a major traffic block, near Emmanuel College, Boston University’s Fenway Campus and the Emerald Necklace walkway. Nearby is Longwood Medical area, including Brigham & Women’s Hospital, Beth Israel Deaconess Medical Center and Children’s Hospital. Police focused their investigation on the center of the large intersection, measuring marks in the road, according to WBZ-TV. The bicycle was crushed and the seat was detached. The cement truck remained on site for several hours before being towed away. Breakstone, White & Gluck is one of the most respected personal injury law firms in Boston. With more than 100 years combined experience, our attorneys represent cyclists and their families in personal injury and wrongful death lawsuits. With a special expertise in investigating truck crashes and an expansive knowledge of the trucking industry, our attorneys have a record of successfully negotiating the best financial results for our clients. Time and again, we have effectively presented the evidence and negotiated the maximum coverage on insurance policies. If you have been injured, learn your rights. For a free legal consultation, visit 800-379-1244 or 617-723-7676 or use our contact form. We invite you to read about one of our recent cases below or in Boston Magazine. 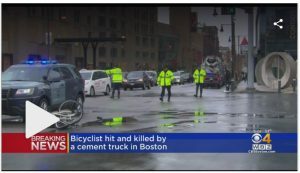 Attorney Ron Gluck was recently interviewed about his work for the family of a cyclist who was struck and killed by a truck in Back Bay. Parking lot serving the MBTA Commuter Rail Station in Waltham. The parking lot is on Carter Street, which the city may upgrade in coming years. Some of the region’s most dangerous roads and intersections are about to be redesigned in Waltham. 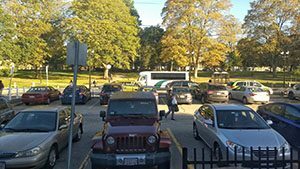 The City of Waltham released its 180-page transportation master plan last January. Some of the steps will drastically change the roads – for example, removing a traffic lane on Lexington Street, acquiring land to expand a road and a “super crosswalk.” The goal is to reduce Waltham car accidents and make it easier to travel the city. This is a 10-year master plan, but some changes have already been made. Over the summer, the city removed a lane of traffic on Lexington Street, from Curve Street to Lake Street. The city’s goal was to reduce car accidents caused by speeding. The speed limit is 30 mph, but drivers often travel 40 to 45 mph. The street was repainted with two southbound lanes and one northbound lane. Over the first few days, there was a lot of confusion. Some drivers continued to travel on the old lane – head-on into traffic in the new lane – putting vehicles at risk for a collision, according to a news report. Breakstone, White & Gluck is teaming up with Boston Bikes, the City of Boston and cycling groups this week to remind cyclists to use bike lights. 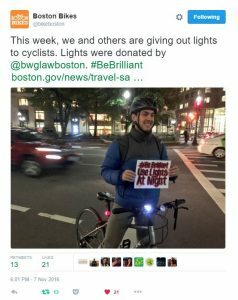 All over the city, cyclists are being surprised with free lights (if they need them), as part of Boston Bikes’ #BeBrilliant campaign to keep cyclists safe. Breakstone, White & Gluck donated the 500 bicycle light sets to Boston Bikes, which is part of the City of Boston, for the third year. Boston Bikes staff and volunteer groups have been giving the lights away this week in Dorchester, Allston, Brighton, Dorchester, East Boston, Mattapan, Roxbury, South Boston and Downtown. Groups include Rozzie Bikes, Commonwheels Bicycle Collective and Bike Dorchester. Under Massachusetts law, cyclists must use bike lights to help them stay visible to motorists. Cyclists must have a white light on the front of their bike and either a red light or a red reflector on the rear. This is an important reminder since Daylight Saving Time ended last weekend and the nights are getting darker earlier. “As evenings get dark earlier, people who are driving, walking and bicycling need to be more aware of each other than ever,” said BTD Commissioner Gina N. Fiandaca, in an announcement posted on the city’s website. “Our top priority is ensuring the safety of people traveling on our streets, and we ask everyone to help us by slowing down and looking out for each other. Here are a few safety tips for drivers, pedestrians and cyclists.